It will be hard to find anyone who does not know this shop in Eindhoven. No matter if you are a cleaner or a professional football player – you will know about this shop. It is always friendly, cheerful and very busy. The basis of this success is the passionate, driven entrepreneur Ed Kloes and his crew. 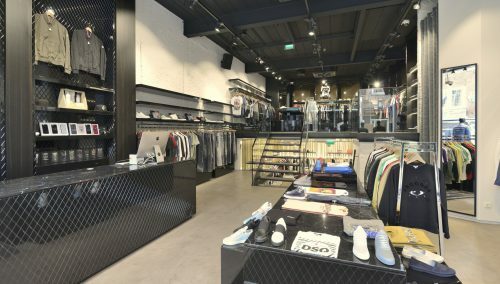 His multi-brand store for both ladies and gents has operated in the mid and high segments. The strategy is to increasingly focus on high-segment brands. This requires a smart interior that reflects this ambition. Together with WSB, they brainstormed on how to get an optimal result. The basis of the store was still fine, it remained intact. Everything else in the interior and design was turned upside down. Smoke glass, black oak, high-gloss black and white and cobra leather became basic elements in the new story, lending the shop a high-fashion look and feel. It has made everyone happy, because it provided a golden idea. Customers are super enthusiastic about it and the shop has risen like a comet in terms of attention from brands and suppliers. Mission accomplished! 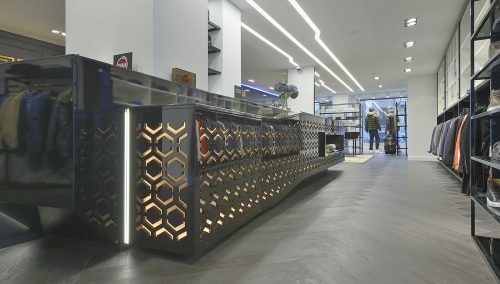 The WSB retail designers create and realise interior concepts and store interiors for fashion shops in ladies’ fashion, gents’ fashion, multi-brand stores, at both mid and high level.